Beer Exam School is a study guide for the Certified Beer Server exam. It has all of my study notes and flashcards that I used to pass the Certified Beer Server exam the first time. This course is not affiliated with or endorsed by the Cicerone® Certification Program. START HERE with the first lesson to study along with me toward the Certified Beer Server exam. See the table of contents on the Certified Beer Server page, for a list of all of my study notes for this exam. My notes align with the different chapters of the Certified Beer Server syllabus. Bookmark the Blog page to keep the most up-to-date. You can also get free flashcards and study notes if you subscribe via email. Sign up for the email list: Enroll now! I’m Nathan Pierce. I quit my job and got a crazy idea to start a brewery (pivot to cidery) here on California’s Central Coast. To learn more about beer, to enhance my resume, and to better communicate with people in the industry, I took the exam for Certified Beer Server. 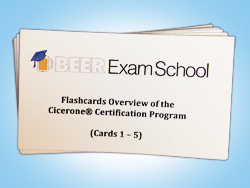 Certified Beer Server is the first level of the Cicerone® Certification Program. It’s just a 60-question exam online, but the syllabus is challenging and there was a lot that I didn’t know yet. Honestly, I had been planning to take this exam for months. Then this website seemed like a great tool to hold myself accountable, organize my thoughts, and help others who are studying for the Certified Beer Server exam. Enroll in Beer Exam School!